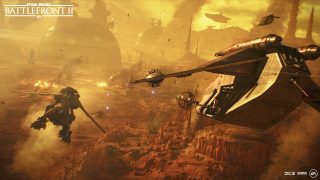 Sith Lord Count Dooku and Geonosis to additional game modes coming January 23. The ex-Jedi turned menacing Sith lord, Count Dooku*, is striding confidently right into Star Wars™ Battlefront™ II on January 23 in the Darth Tyranus Update**. Geonosis – a Clone Wars battlefront which was brought to Galactic Assault in November – is now coming to the game modes Blast, Heroes vs. Villains, and Custom Arcade. Here’s everything you need to know about the latest update. Once an apprentice of Master Yoda, Count Dooku turned his back on the Jedi Order with a thirst for more power, assuming his Sith identity, Darth Tyranus. Serving the dark side, he supervised the creation of the clone army on Kamino, trained General Grievous in the art of lightsaber combat, and educated the Dathomirian Asajj Ventress in his teachings. Undoubtedly an experienced and skilled duelist, Count Dooku engaged in combat with elegance. He wielded his signature red lightsaber emitting from a curved hilt, allowing him to fight with refined accuracy. These qualities of sophistication and power are what we’re bringing to life with the Sith Lord entering Star Wars Battlefront II. Count Dooku’s melee attacks are highly lethal and he’s able to deflect opposing lightsabers with great efficiency. This is signified by a wider blocking range and less stamina depletion compared to other heroes. It comes at a cost, however, with Dooku lacking in his capability to deflect blaster shots. 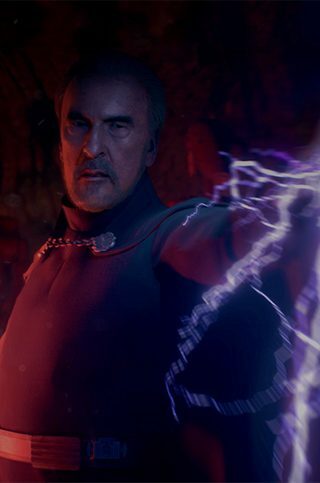 Looking at his special Abilities, Dooku unleashes the Lightning Stun to throw enemies within range to the ground, inflicting harm, and leaving them in the open to follow-up attacks. The Expose Weakness Ability, on the other hand, influences the target with slower movement and an increased amount of damage taken from Dooku and his allies. If Dooku eliminates the target personally by delivering a final blow, this Ability recharges immediately. Activating the Duelist Ability showcases the true grace of Dooku’s skillset when it comes to lightsaber combat. The Ability changes up his attack sequence, with Dooku performing quick slashes – one hand on his back – with a high damage output. 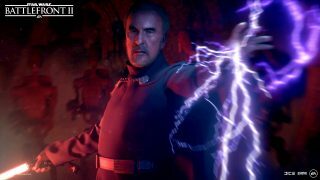 Count Dooku himself will arrive with his default Sith Lord outfit, donning a brown cape, and the Dark Ritual Appearance*** will be available to unlock on January 30. We believe that the Dark Ritual Appearance will appeal a little extra to fans of The Clone Wars, as it originates from the sixth season, The Lost Missions, of the animated series. Another, yet to be announced, Appearance for Count Dooku is set to arrive later in February. We’re also happy to announce that Geonosis will be added to the Heroes vs. Villains, Blast, and Custom Arcade game modes as part of our January update. Set in the Geonosian canyons, you can now enjoy fighting on the barren world in the smaller, more focused game modes. We’re excited to get the latest update in players’ hands on January 23, and don’t forget to keep an eye out on the roadmap to get an overview of upcoming updates. Make sure to join the discussions on our official forums or on social – follow EA Star Wars on Twitter, Facebook, and Instagram. Also, sign up today to receive the latest Star Wars Battlefront II news, updates, behind-the-scenes content, exclusive offers, and more (including other EA news, products, events, and promotions) by email. *New heroes are available for Credits earned in-game. **All updates require Star WarsTM BattlefrontTM II on applicable platform (sold separately), all game updates, internet connection, EA account, and, for console players, Xbox Live Gold or PlayStation Plus membership (each sold separately). ***Appearances available for Credits earned in-game or Crystals.